Aren't those the cutest mozzarella balls you have ever seen. I have never seen them so small. They are called pearl size. I just had to post this because they are so cute. This recipe I slightly adapted from Everyday FOOD by Martha Stewart. We usually do pizza on Friday nights, so I thought we would switch it up and so a stromboli. I already had my awesome pizza dough made, so I just used that. There really isn't a need for a recipe when making stromboli, you can pretty much just clean out your fridge with these. But this combination of broccoli, salami, and mozz was good. Preheat oven to 400. Line a large rimmed baking sheet with foil. Divide dough into 4 pieces. On a lightly floured work surface, stretch out each piece, into a 6X8 oval. Place broccoli in a strainer, and press to remove excess liquid. Transfer to a double layer of paper towel and pat dry. Divide evenly, scatter broccoli over dough, leaving a 1/2 inch border. Sprinkle with garlic, and season with salt and pepper. Dividing evenly, top with mozzarella, salami and marinara. Starting at a shorter end, roll up each stromboli and place, seam side down, on baking sheet. Using the tip of a paring knife, cut 2 slits in top of each. Bake until golden, 25 to 30 minutes. Serve with marinara for dipping. THE VERDICT: This was perfect for game night. I served it with a tomato, mozzarella salad. Ok this is my kind of dinner....I love eggs! The boys weren't thrilled, until they tried it once again. They even requested it again. So the moral of this story...don't judge dinner by the name! I found this recipe while flipping through my most current version of Everyday FOOD by Martha Stewart. The original recipe calls for Parmesan instead of feta, but when it came time to add the parm. I realized I was out. So I subbed feta, and I probably won't change it back. Preheat oven 350. Set 4 oven-proof bowls on a large rimmed baking sheet. In a large saucepan, heat oil over medium heat. Add garlic and rosemary; cook, stirring, until garlic is golden, about 2 minutes. Add diced tomatoes(with juice), crushed Season with salt and pepper. tomatoes, and red pepper flakes; bring to boil. Reduce to simmer, and cook, stirring occasionally, until slightly thickened, 2 to 4 minutes. Divide tomato sauce among bowls, reserving 1 cup. Crack 2 eggs into each bowl. Dividing evenly, top with reserved sauce and feta. Bake until egg whites are just opaque, 24 to 28 minutes, rotating sheet half way through. THE VERDICT: Don't accidentally turn the oven off when you rotate the baking sheet. OOPS. Eggs took a little longer due to my mistake. Oh well they still tasted great. I served this with a jalapeno cheddar bread. Abe put a hot dog on top, which I wouldn't recommend, but if you think you need meat maybe try Italian sausage. OOPS...I forgot to take a pic til it was half gone. Looks kinda gross huh. This is the best Mac 'N Cheese ever! My mom made this for us growing up, and now it is my hubbies favorite too. Plus its super easy and convenient due to the crock pot. Just throw it in and dinner is ready when you are. Oh and those are "Nathan's" hot dogs too! Boil shells until el dente. In crock mix all ingredients together. THE VERDICT: LUV IT! My favorite part is the edges where it get a little brown, but it is all good. This dish doesn't last long in this household. I also remember as a kid requesting this as my birthday dinner! Enjoy! I got these great mini bundt pans from my last WC exchange, and they were perfect for today's baking extravaganza. This is a "Cooking Light" recipe that my mom and I have made for many occasions. It is a nice light cake and the flavors really shine through. I ended up with nine mini cakes from one recipe. Which is perfect because I froze most of them. Now when we need a little dessert I can just pull one out of the freezer, make a quick glaze, and dessert is served! Beat granulated sugar, butter, and cream cheese at medium speed of a mixer until well-blended. Add eggs and egg white, 1 at a time, beating well after each addition. Beat in vanilla. Lightly spoon flour in to dry measuring cups. Combine 2 T. flour and blueberries in a small bowl; toss to coat. Combine remaining flour, baking powder, baking soda, and salt. Add flour mixture to sugar mixture alternately with yogurt, beginning and ending with flour mixture. Fold in blueberry mixture. Pour batter into a 10 inch tube pan coated with cooking spray. Sharply tap pan once on counter to remove air bubbles. Bake at 350 for 1 hour and 15 minutes or until a wooden pick inserted in center comes out clean. Cool cake in pan 10 minutes on a wire rack; remove cake from sides of pan. Cool additional 15 minutes on wire rack; remove cake from bottom of the pan. Combine powdered sugar and lemon juice in a small bowl; drizzle over warm cake. Cut into slices using a serrated knife. THE VERDICT: YUM! and they look so pretty. Just image serving this on Easter after a huge meal. I think this cake just screams spring, and I am sure most of you are ready for it! This is one of my favorite sandwiches to get at Whole Foods! My mom picked up the cookbook for me, and now I can make all my favorites. In a bowl combine the mayo, vinegar, honey, poppy seeds, salt and pepper. Reserve the dressing in the refrigerator. This may be done 2 days prior to mixing the salad. Bake or grill chicken breasts til cooked completely. Cool slightly at room temperature, then chill completely, lightly covered in plastic wrap, in the refrigerator. When the chicken is cold, dice into bite size pieces, and transfer to a large bowl. THE VERDICT: This was gone before I knew it......which is uncommon in this household, due to the fact no one like leftovers. My hubby was a little weary at first due to the grapes, but really enjoyed it. I knew it was a winner, because I have bought it many times. I want to thank Deal Squealer for nominating me for this award!!! It's great to know people actually read and somewhat like my blog. Thanks again! Veggie Night in the Wilson household, and boy did I hear it. What no meat? Once they started eating they were really enjoying themselves, and didn't even miss the meat. Go figure. This is a Cooking Light recipe, which I modified. Score cut side of each eggplant half by making 4 crosswise cuts. Place eggplant, cut side down, on a foil lined baking sheet coated with cooking spray. Bake at 400 for 25 minutes. Remove from oven; cool on pan 10 minutes. Carefully remove pulp, leaving 1/3 inch thick shell; reserve eggplant shells. Chop pulp. Reduce oven temp. to 350. Heat a large non-stick skillet coated with cooking spray over medium high heat. Add onion, saute 3 minutes. Stir in chopped eggplant, bell pepper, tomato, oregano, garlic; cover, reduce heat, and simmer, stirring occasionally. Uncover and cook 5 minutes or until liquid evaporates, stirring occasionally. Remove from heat; stir in cheese, parsley, salt, and pepper. Stuff each eggplant shell with about 1/2 cup onion mixture; sprinkle with panko, and drizzle with olive oil. Place on a baking sheet; bake at 350 for 30 minutes or until thoroughly heated and slightly brown. THE VERDICT: Definitely going to make this again. It is so savory, and a perfect light meal. I served this with Creamy Parmesan Orzo, which is posted below. You can make this ahead, and then bake when ready. Heat oil in a large pot over medium heat. Add carrots, celery, and onion and cook, stirring occasionally, until onion is translucent. Add garlic, ham and 1 tsp. salt, and cook for 3 minutes. Add spices, split peas, and water. Bring soup to a boil. Reduce heat and simmer, stirring occasionally, until peas are tender and begin to fall apart, about 50 minutes. Discard bay leaf. Season with remaining 1/2 tsp. of salt. The Verdict: We all had 2 bowls!! I served this with fresh baked egg bread, and it was perfect for the chilly rainy day we are having today. Not only does this warm you from the inside out, it is very nutritious. Only 360 calories a serving! The original recipe called for fresh herbs tied in cheese cloth then removed at the end. But once again the aerogarden is still not ready, and I didn't want to go out in the rain to get some. The dry substituted fine. Next time I will use fresh. Oh yeah...This tastes like rissoto, buts its orzo and its light. Bonus! This recipe is adated from cooking light. I own every year book since 2004 and every month I go through the current months section..aka..March this month....and pick things to make. I made this as a side dish. Heat butter in a saucepan over medium heat. Add orzo, and cook for 3 minutes, stirring constantly. Stir in broth and water; bring to a boil. Reduce heat and simmer until liquid is absorbed and orzo is done. Remove from heat; stir in cheese, basil, salt, and pepper. Sprinkle with pine nuts. Serve immediately. The Verdict: This was gone before the main course. I t was also requested again very soon. I thought it was very creamy, and almost tasted like rissoto. Next time I make it I will use my fresh basil, I can't wait. The boys also suggested this as a main dish one night. Why?, because there is no veggies! I do overload them a little bit, but hey its good for them. Recipe from Rachael Ray Mag. 1. Preheat the oven to 350°. In a medium bowl, combine the spinach, hummus, pine nuts and nutmeg. Season with salt and pepper. 2. Season the chicken with salt and place one-quarter of the hummus mixture on the right side of each breast. Fold the left side over the mixture. Using toothpicks, close the open sides. 3. Place the flour in a wide, shallow bowl and season with salt and pepper. Beat the eggs in another bowl and place the panko in a third bowl. Coat the stuffed chicken with the flour, shaking off any excess. Dip the chicken in the egg, then coat with the panko. 4. In a large skillet, heat the butter over medium-high heat until the foaming stops. Add the chicken and cook, turning once and adjusting the heat as necessary, until golden, 3 to 4 minutes per side. Transfer the chicken to a foil-lined baking sheet and bake for 10 minutes. Let rest for 5 minutes. Discard the toothpicks and slice each breast into pieces. THE VERDICT: These were good but, I had to cook them for about 20 minutes rather than 10. I guess it just depends on how thick you chicken comes out after pounding. Hence the extra time meant extra hungry boys! Sorry I'm not Mrs. Perfect. My husband also informed me to stop stuffing chicken, because we can't tell when they are done. Oh well, once all was said and done, we scarfed them down and really enjoyed the flavor. I'm sure this will taste different with every type of hummus, so just pick you FAV! P.S. I forgot to take a picture, so this one is from The Rachael Ray Mag website. This tasty rice recipe is from A Taste of Home Cooking Blog, and it complimented our tamales perfectly. Yes I cheated I bought pre-made, but they are so good. 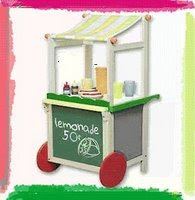 They are made at the local market down the street, and every week they have a different flavor. These we chicken, jalapeno, and tomatillo. But back to her blog.....She made these great looking Texas BBQ Quesadilla, and those are definitely on my list to make. I did slightly modify this recipe. In a large pot, bring the rice and chicken broth to a boil. Reduce heat to low, cover, and simmer 20 minutes. Lightly grease a 1-1/2 quart casserole dish. In the pot with the cooked rice, mix the sour cream, green chile peppers, 1 cup pepper Jack cheese, corn, and cilantro. Season with salt and pepper. Transfer to the prepared casserole dish, and top with remaining cheese. Bake uncovered 30 minutes in the preheated oven, until cheese is bubbly and lightly browned. We all know that I love wine. All Kinds! So I have decided to feature one wine per month that has been a great find. This month....Weibel Vineyards Almond Flavored Sparkling Wine! Abe and I enjoy sparkling wine every once and while, Ok I'm lying...alot! I found this Almond Flavored Sparkling Wine at Wine Styles, a local wine shop. At first I wasn't sure about it, but come on it's different, so I had to try. We took this with us on our mini-vacation to Austin this weekend, and it was a great way to kick it off. This wine has a subtle almond flavor, that comes out in the after taste. It is a little sweeter than we normally drink, but not over bearing. I think this wine would be great during the holidays, with cookies!! So out try it, and let me know what you think! Pound out the chicken breasts until thin. On each chicken breast, spread 1 wedge Laughing Cow Light cheese, 1/4 tsp garlic, and some McCormick Italian Seasoning. 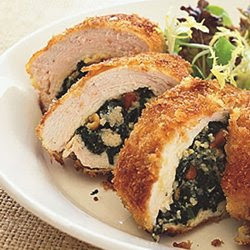 Roll up each chicken breast and secure with a toothpick.In a shallow dish, combine bread crumbs, parmesan cheese, and parsley. Dip each rolled chicken breast in the mixture and place on a greased cooking sheet. Bake at 400 degrees until no longer pink, about 25-30 minutes. Remove the toothpicks and serve. THE VERDICT: We loved this dish and will definitely make it again. We are always looking for new ways to make chicken, beside just grilling it. This was a tasty combo, plus I have cheese leftover for healthy snacks. Ok Sorry...NO PIC!! I have no idea how to take a good picture of dressing. So I will just give you the recipe. This is my go to dressing for spinach salads. Whisk all together until oil and vinegar has combined. Serve with Spinach salad!! The Verdict: Abe loves this dressing, he was complaining that I had not made it in a while, so here you go!! This is a great dressing to take with a salad to a party, or just to enjoy at home. I usually half this recipe when it just the two of us, and it lasts a while. Recipe adapted from "Cooking Light"
These muffins are a great source of Vitamin E, to keep you mind sharp and your blood vessels healthy, so eat up! Lightly spoon flour into a dry measuring cup; level with knife. Combine flour and next 7 ingredients in a large bowl; stir with a whisk. make a well in the center of the mixture. Combine brown sugar and next 4 ingredients; stir with a whisk. Add egg mixture to flour mixture; stir until just combined. Spoon batter into 12 muffin cups. Bake at 375 for 17 minutes or until muffins spring back when touched in the center. The Verdict: Quick, easy, and healthy breakfast for the rest of the week. These are at their best warm, so reheat in microwave before eating. No Wonder We Have Been Having Problems With The Lap Top!!!!!!!! Place bread in food processor pulse 10 times or until coarse. Melt butter in large sauce pan over medium heat. Add sliced onion and minced garlic, and cook one minute. Add flour, cook one minute, stirring constantly. Gradually add milk, salt, and pepper stirring constantly with whisk until blended. Bring to a boil, and cook until thick. Remove from heat, and cheeses, stirring until melted. Add spinach and macaroni to cheese sauce, stirring until well blended. Spoon mixture into a 2 quart baking dish coated with cooking spray. Sprinkle with bread crumbs. Bake at 350 for 15 minutes or until bubbly. The Verdict: Abe thought it needed more cheese. I thought it tasted perfect. Next time might use 3/4 cup of gouda. This is a good way to get a little bit of veggies into your diet, come on who doesn't like mac and cheese!! Calories 399 per serving! WooHoo! MMMM.....What a healthy start to your day. This is a perfect post work out smoothie, or a healthy breakfast. The verdict: This treat was for me, and I loved it. Haha like my Texas shaped chips!! Preheat oven to 375. In a large skillet, heat oil over medium heat. Add the chicken and cook, turning once, until cooked through, 10-12 minutes. Let stand until cool, then shred meat in a large bowl. Stir in salsa, kidney beans, onion and sour cream. Grease a 8 X 12-inch baking dish, scatter with 1/2 cup tortilla chips on the bottom and top with half of the chicken mixture, and half of the cheese. Repeat layers and cover with the remaining tortilla chips. Bake until cheese is bubbly, about 30 minutes. The Verdict: Good Comfort food on a cooler day. Easy to prepare. Everyone had seconds. Recipe adapted from "Everday with Rachael Ray"